The Book of Gates is the principal guidebook to the netherworld found in 19th and part of the 20th Dynasty tombs of the New Kingdom, though it makes its first appearance to us with the last king of the 18th Dynasty. It was meant to allow the dead pharaoh to navigate his way along the netherworld route together with the sun god, so that his resurrection could be affected. It emphasizes gates with guardian deities who's names must be known in order to pass them. 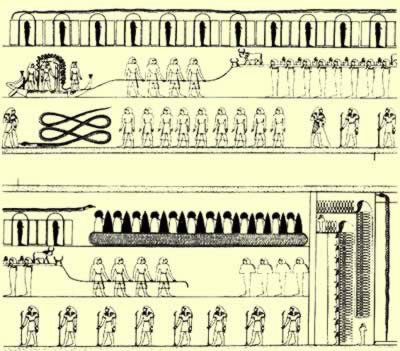 This is actually a very old tradition dating to at least the Book of the Two Ways in the Coffin Texts, where there are seven gates with three keepers at each. We are not sure exactly when the Egyptian afterlife text known as the Book of Gates was composed. 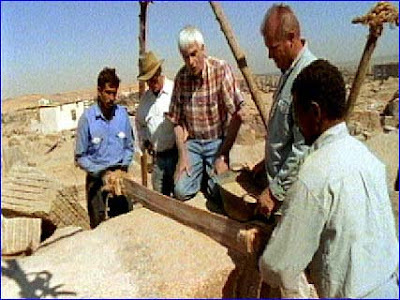 While some authorities, such as Hartwig Altenmuller, believe that, because of its similarity to the Amduat, it sprang from a time prior to Egypt's New Kingdom, others think it may better be attributable to the Amarna period. Regardless, the first example Egyptologists are aware of is that incomplete version in the tomb of the last pharaoh of Egypt's 18th Dynasty, Haremhab, who had the text placed in the sarcophagus chamber where, until then, the Amduat had been customary. 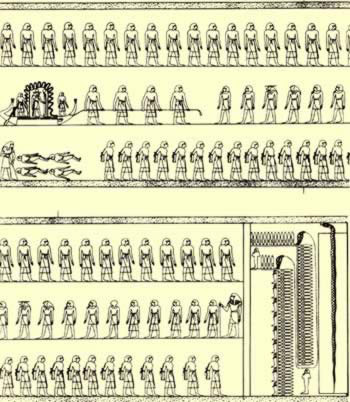 The founders of the 19th Dynasty also employed the Book of Gates. Ramesses I included it alone in his tomb in the Valley of the Kings on the West Bank at Ancient Thebes (Modern Luxor), while his successor, Seti I', decorated the sarcophagus chamber of his tomb with the Amduat, reserving the Book of Gates for his two great pillared halls. This version includes only the first half of the book. However, Seti I's alabaster sarcophagus is adorned with the earliest complete and continuous version of the book. The famous Ramesses II also used the text in the upper pillared halls, sarcophagus chambers and subsidiary rooms of his tomb and his son, Merneptah, decorated the right wall of the corridor of his grandfather, Seti I's cenotaph at Abydos with a complete Book of Gates. There, he also placed the Book of Caverns on the left wall. From Merneptah, the following kings until the reign of Ramesses IV had the text recorded on the walls of their sarcophagus chambers. 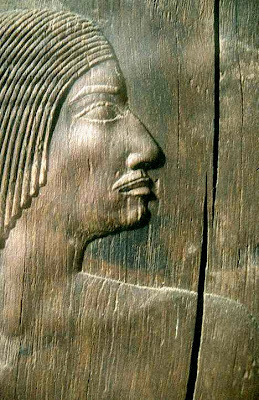 A number of kings, such as Ramesses III also had selected text from the book placed on their sarcophagus, and some commoners, such as Tjanefer, a priest of Amun under Ramesses III, were also allowed to use a selection of the scenes. Ramesses VI broke from this tradition, replacing the text with the Book of the Earth in the sarcophagus chamber, but included a complete Book of Gates in the upper part of his tomb. 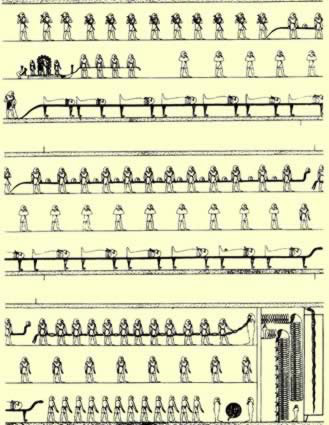 However, Ramesses VII was actually the last pharaoh to include any of the Book of Gates, using the first and second hours in a single corridor. By Ramesses IX, it disappeared entirely from royal tombs. After the New Kingdom, portions of the book continued to show up only sporadically, perhaps because the composition is so oriented to the specific person of the king. We find the concluding representations in the Book of the Dead of Anhai, which may date to the 20th Dynasty, as well as in the mythological papyrus of Khonsumes that dates from the 21st Dynasty and in the 26th Dynasty tomb of Mutirdis. Other extracts from the text are also found in the tombs of Petamenophis at Thebes and Horiraa at Saqqara, while the first hour and judgement hall occur often on late, non-royal sarcophagi. 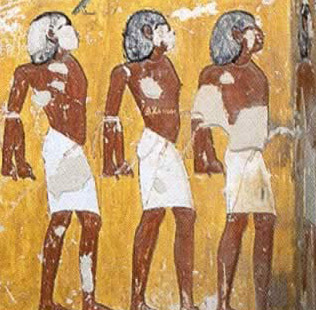 Because, in the tomb of Seti I and the Judgement of the Dead in the tomb of Ramesses VI, the Book of Gates depicted foreigners, it aroused the interest of scholars at an early date. These particular text were frequently copied. However, it was Jean-Francois Champollion who provided the first description of the Book of Gates, along with some translations in his 13th letter from Egypt, dated May 26, 1829. He mostly relied on the tomb of Ramesses VI for this translation. Yet the standard publication for many years was from an 1864 documentation of the alabaster sarcophagus of Seti I by Bonomi and Sharpe. In the ancient Egyptian text, the book is not named, so it was Gaston Maspero who originally designated it Livre de Portes (Book of Gates). He also referred to it as the Livre des Pylones, or "Book of Pylons, and Eugene Lefebure called it Livre de l'Enfer, or "Book of the Netherworld". Lefebure also provided a brief survey of its contents for an essay in 1888. Previously, he had already published the first translation of the text on from the Seti I sarcophagus in 1878 and 1881. In 1905, Budge described and translated the sarcophagus version and made a comparison between its hours of the night and those in the Amduat. However, because by this time the lid of the sarcophagus had been destroyed, his analysis was erroneous. The incomplete version of the Book found in the tomb of Horemhab was published in 1912 (after having only been discovered in 1908). More recent editions of the Book of Gates include that published by Charles Maystre and Alexandre Piankoff, who created a broader textual basis with their work of 1939-1962. However, this version was replaced by that of Erik Hornung in 1979. Today, the complete English version of the text by Pankoff has been available since 1954, while the German translation created by Hornung has been around since 1972. The Book of Gates portrays the gates of the netherworld far more visibly and systematically than other similar compositions. It compares most readily with the gates in the Book of the Dead, spells 144 and 145, which the Ramesside Period Egyptians considered a substitute for the Book of Gates in tombs that did not belong to pharaohs, such as that of Nefertari and others in the Valley of the Queens. In fact, gates in the Book of the Dead spells and elsewhere have caused some confusion with the Book of Gates even among some scholars. The concept of gates in the afterlife was a reoccurring theme amongst many of the books of the afterlife. 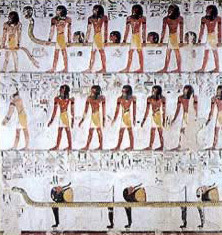 On the sarcophagus of Seti I, the hours are in a continuous sequence resulting in the concluding scene occurring directly behind the head of the deceased. 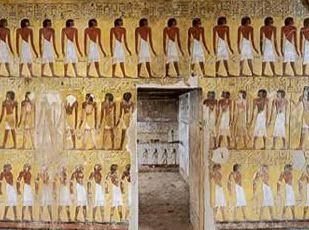 The Osireion and the tomb of Ramesses VI also provide a continuous text, though in other tombs the hours are distributed over various walls and rooms. The Book of Gates encompasses a total of one hundred scenes, many of which fill an entire register, though the last two hours contain a number of brief individual scenes. The Middle Egyptian of dialect of the text displays hardly any influences from the Late Egyptian written language, though it has been established that this composition contains an especially rich vocabulary. The structure of the Book of Gates is very similar to that of the Amduat, with twelve nocturnal hours each divided into three registers. As in the Amduat, the first hour of the night has a special position with a structure that differs from the remainder of the composition. 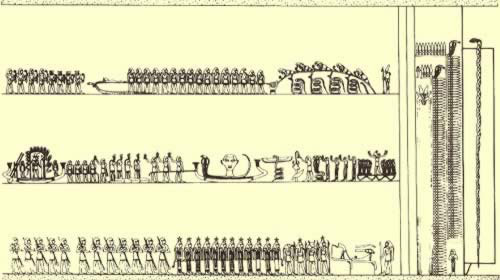 However, in the last three hours, the main figure (Atum or Horus) is omitted from the lower registers, which show only deities and not the blessed dead. Also absent are long concluding texts. Instead, we find depictions of the Judgment of the Dead and the course of the sun, not divided into registers, in the middle and at the end of he composition. Also absent are notations concerning the use of the Book, but are replaced by remarks about offerings, which as a rule are located at the end of a scene (though not in the final three hours). The Book of Gates also differs from the Amduat by the means of the gates depicted at the end of each hour. In the Book of Gates, each gate has a guardian in the form of a serpent on its door, as well as two further guardians with scary names and fire spitting uraei. Also, in the solar barque, only two gods, Sia and Heka are found depicted together with the sun god, while there are many crew members in the Amdaut. 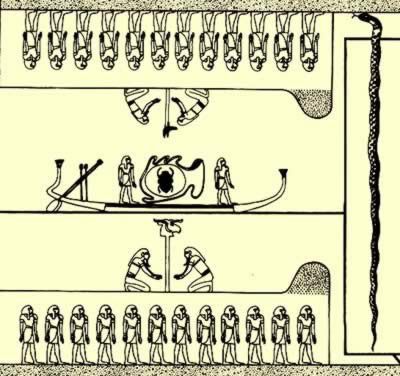 In the Book of Gates, the cabin of the barque in each hour is protected by a mehen-serpent and four male figures are portrayed like hieroglyphs towing the barque. 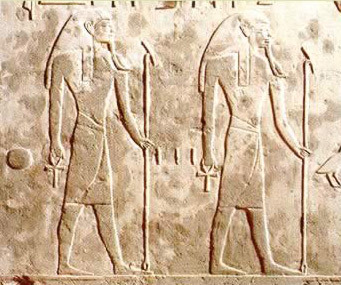 In the sarcophagus chambers of Haremhab, Ramesses I and Seti I, the clothing and beards of these figures clearly mark them as human, rather than divine beings. The judgement hall of Osiris is given a special, central position inserted into the fifth gateway of the Book of gates. Situated just prior to the union with the sun's corpse in the sixth hour, the texts are specifically cryptic. However, beginning with the tomb of Seti I, this judgment scene is replaced by one depicting the king before the enthroned (and later standing) Osiris, so that no longer are the dead judged, but rather the king is identified with the ruler of the dead. More than a thousand deities and deceased persons, representing many more than in the Amduat, are depicted within the Book of Gates. However, they are more regularly combined into groups, and they bear fewer individual names. Many of these groups represent deceased persons rather than deities. This text, like other netherworld compositions, is concerned with the nocturnal journey of the sun. Compared to the Amduat, the hours are somewhat displaced. For example, in the Book of Gates, the drowned appear in the ninth rather than the tenth hour. Also, because of the grouping of deities and deceased persons, they are more clearly distinguished from each other then in the Amduat, and the dead appear bound to their respective regions in the hours of the night. Here also, the dead king's special status is more clearly defined, as he accompanies the sun god to his rebirth in the morning. In fact, most versions contain additions to the texts and representations that refer directly to the king. As the sun god inters the ream of the dead, he is greeted by the collective dead, who are assigned the title of "gods of the west:", rather than individual deities. Actually, as in the Amduat, this first hour is an interstitial place that precedes the actual netherworld after the first gate. Here, there are two steaks surmounted by a ram's head and a jackal's head that both punish and reward those who dwell here. 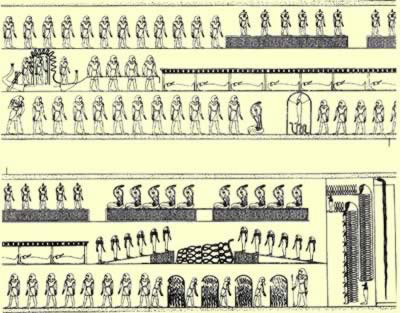 The third hour of the Book of Gates appears to emphasis a few motifs that are central to the nightly journey, including mummies in the upper register, which are awakened from the dead and reanimated in their shrines. Here also is the ambivalent Lake of Fire, where the damned will meet flame. However, the blessed dead are provisioned from the same flames. The middle register depicts the sun god being towed along in the "barque of the earth"., a symbolic condensation of his entire journey through the depths of the earth. At the end of the register he is dressed in sparkling white linens which is also symbolic of renewal. However, Aphophis the snake makes his first appearance in front of Atum as well. Atum must be assisted by two Enneads in order to overcome this archenemy. Perhaps variations of the Lake of Fire from the third register, two bodies of water dominate the top register in the fourth hour of the Book of Gates. They are called the Lake of Life, which is guarded by jackals, and the Lake of Uraei. In the middle register, shrines containing mummies of the dead, not yet risen, stand before the barque. The sun god causes their resurrection and provisioning. Their renewed life in the hereafter occupies an entire hour of the night. The passing of the hours is laid out in the following scene, with its many-coiled serpent representing time and its twelve goddesses embodying the hours. The enshrined Osiris is protected on all sides by the gods of his entourage in the lower register, while Horus cares for his deceased father. Osiris' enemies are punished in the fiery pits at the end of the register. Hour Five is one of the most complex hours within the composition. 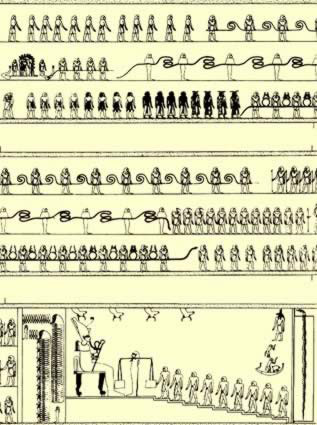 In the upper registers, the gods are portrayed with a surveying cord, because the deceased are allotted space (in the form of fields) within this hour. 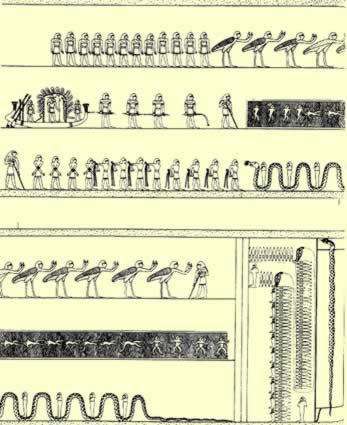 The deceased are also allotted time, and hence the gods also carry the body of a serpent and the hieroglyphs meaning "lifetime" in the lower register. In order to accomplish this, the Apophis fiend, known as "the Retreater, must once again be battled and fettered. Behind Apophis we notice the ba-souls of the blessed dead, and at the beginning of the lower register are found the four "races" of mankind, including Egyptians, Asiatics, Nubians and Libyans. Each race is represented by four individual figures, who are assured existence in the afterlife. They are placed in the care of Horus and Sakhmet. 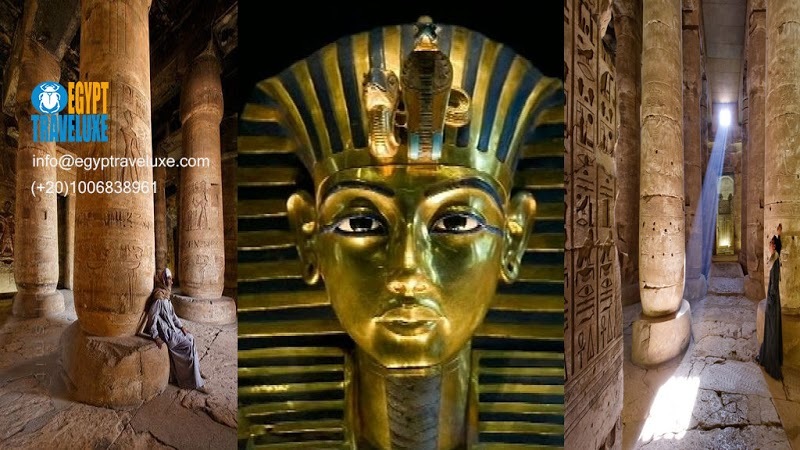 It should be noted that the Great Hymn of Akhenaten, Aten is said to care even for foreign people, and hence, they are sheltered in the realm of the dead, according to the Book of Gates. Just before the sixth hour, we find the portrayal of the Judgment hall, empathized by its insertion as a special scene. This is the only representation of the Judgment of the dead in any of the Books of the Netherworld, and so it is distinguished by the use of cryptographic writing. In the earlier versions, Osiris is enthroned on a stepped dais while the personified scale in front of him, unlike that in the Book of the Dead, bears empty pans. Therefore, the blessed dead stand on the steps of the dais, while the enemies who are consigned to the "Place of Annihilation" lie beneath their feet. Here also, we see another mincing power in the form of a pig being driven off. The judgment of the Dead is therefore the prelude to the union of the Ba and the corpse of he sun god (like those of all the blessed deceased). The sixth hour of the night is the deepest part of the journey through the netherworld. In the middle register, the dead corpse of the sun god immediately in front of the barque and its towmen, is invisible. It is being carried by gods whose arms are also invisible because of their contact with the corpse. 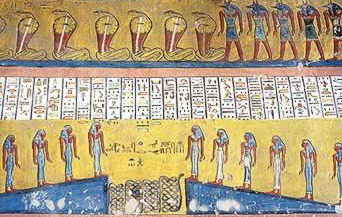 In the lower register, mummies of deceased persons lie on a long, serpent-shaped bed so that they may participate in the union with the ba and the resurrection that it effects. 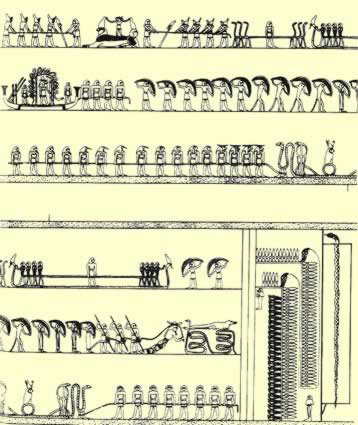 Gods holding forked poles in the upper register keep Apophis at bay while this critical event unfolds. From his head people who he has swallowed are now set free once more. There is also the depiction of a twisted double rope that represents time. It is being unwound from the pharynx of the god, Aqen. The lower register of this hour end with a scene depicting a circular Lake of Fire which is inhabited by a cobra that acts as a deterrent to all enemies. In the seventh hour, the central motif is the elimination of all mincing forces that might interfere with the sun's renewal. In the middle register, just before the solar barque, appears the jackal headed "stakes of Geb", with two enemies of the god bound to each. Re, the sun god consents to their torment by two demons. 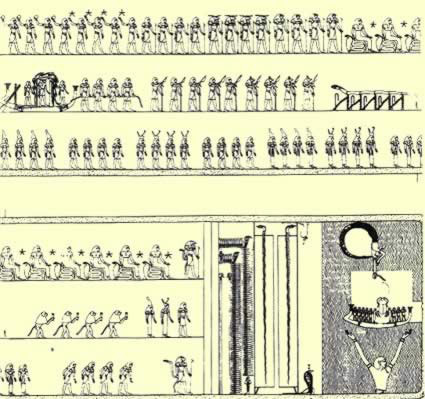 However, in the upper register we find two groups of blessed dead, one with baskets filled with grain as a sign of their material provisioning, and the other with the feather of Ma'at as a symbol of their vindication in at the Judgment of the Dead. They will exist until the end while sheltered by Ma'at, while the damned below are consigned to the Place of Annihilation. 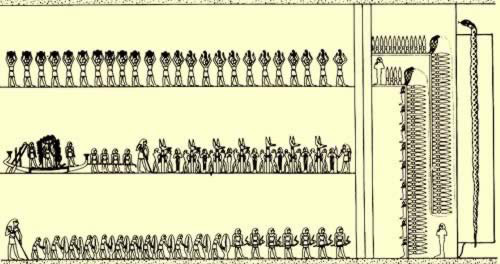 The caption on this upper register speaks of Osiris welcoming his new followers. In the lower register, we again find the blessed who have followed Ma'at, who are here gathering huge ears of grain intended for their assured provisions. Others are provided with sickles for harvesting, while the rays of the revived sun effects abundant fertility. We once again find the depiction of infinite time depicted as an endless rope spooled out hour by hour, and also as the towrope of the barque, which "produces mysteries." In the middle register, the "lords of provision in the west", who stand before the barque, are commissioned by Re to allocate provisions to the blessed while at the same time inflicting evil on the enemies. In the lower register are once again mummies. They have turned over on their biers and are therefore in the process of resurrection. Nearby, a council of judges protects them. In the middle register of the ninth hour, a theme is borrowed from the Amduat (tenth hour). Here, a rectangle of water contain the drowned. Four groups of deceased humans are found floating in the primeval waters of Nun. They are actually being refreshed by the waters and will therefore be resurrected. We find that their noses breath the air, and their ba-souls will not be destroyed so that they will share existence with the blessed. In these scenes, Re is the "one who is in Nun", and in the scene that concludes the book, he will be raised up out of Nun. The souls of the blessed appear in the upper register. Before them stand a group of figures who offer them bread and vegetables. By contract, in the lower register we find, once more, the condemned. 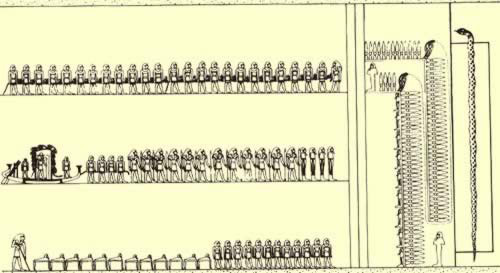 Here are depicted twelve enemies who are each bound in one of three different manners. They are inflamed by the Fiery One, a huge serpent who has been called forth by Horus for the atrocities they have committed against his father, Osiris. The children of Horus stand in his coils of this great snake. The middle register of the tenth hour is entirely filled with a representation of the battle against Apophis. Fourteen deities hold nets containing magical powers above their heads. This magic renders Apophis defenseless. Perhaps Geb, as the "Old One" ties fetters around the snakes body. In the upper and lower registers we find special manifestations of the sun god. In the upper register, he is depicted as a griffin and is followed by two serpents who help in the punishment of Apophis, as well as the other enemies. In the lower register the sun god is portrayed in the center as a falcon, though he is also referenced as Khepri ("scarab beetle"). He is connected to other figures by a continuous rope. The text that accompanies this scene talks of the "emergence" and stresses that the journey is proceeding now towards the sky. By the eleventh hour, we find a bound Apophis and other enemies in the upper register. He is dismembered, and hence rendered harmless. The rope that holds Apophis and his assistants is held by a giant fist emerging from the depths. In the middle register, the dead may gaze upon the continence of the God Re, who's face is making its way in the barque. n interesting aspect of this scene is the reversal of the barque, which may be an allusion to the reversal of time. Before the barque are the stars which will herald the reappearance of the sun god. We find in the lowest register oarsmen of the god, together with the goddesses of the hours; time and energy (rowing). They will propel the barque up into the eastern horizon. Here, the battle in the netherworld is obviously won, for some deities are already announcing he god in the horizon. There cries will be joined by the din of noise that will eventually accompany the rising sun. In the twelfth hour, the sun god finally arrives at the gate "with the mysterious entrance", through which he will the miracle of his rebirth will occur. In the upper register, gods "carry the blazing light". which is obvious from the sun disks in their hands. Stars precede the appearance of the sun, while goddesses seated upon serpents surround and protect the solar child. Before the god's barque lies Apophis, who is fettered. He is held in check by gods with knives and shepherd's crooks in order that he may not impede the sunrise. Just behind him are four baboons, their arms raised in jubilation, who announce the sun god in the eastern horizon. Several motif are represented in the lower register, including crowns that are to be worn as symbols of power when leaving the netherworld. Also, we find the nurses of the newborn sun, while at the same time, Osiris is mourned, for he must remain in the netherworld. This final gate, through which the sun god will emerge onto the horizon, is guarded by Isis and Nephthys, in the form of uraei. The final scenes are not divided into registers as elsewhere. Like many illustrations accompanying the solar hymns of the Amarna period, the entire course of the sun is condensed into a single picture. Half hidden by the primeval waters indicated by wavy lines, the god Nun raises the solar barque of its depths. In the Barque, Isis and Nephthys embrace the sun in the form of a souring scarab beetle, as he pushes the sun disk toward the sky goddess Nut. She is upside down, indicating the inversion of the sun's course, which will once again run in the opposite direction from its course through the netherworld which is here the embodiment of Osiris. He surrounds this dark world with his curved body. Therefore, all three areas of the cosmos are represented, including the primeval waters, the height of the heavens and the depths of the earth. From above and below, arms embrace the sun, holding it aloft as it moves through the day.